Global Green is a member of a diverse coalition of partners who are rallying against a ban on development in Los Angeles: Measure S. Global Green supports cities and neighborhood organizations in Los Angeles and throughout the U.S. by: conducting assessments of neighborhoods’ sustainability; identifying and engaging stakeholders and community members; and making recommendations ranging from policy intervention, to development strategy, to helping “activate” urban spaces through events and tactical urbanism. Global Green provides affordable LEED for Homes Certification for affordable multi-family developments, such as Casa Yondé, a 52-unit affordable housing development (18 units set-aside for supportive housing for homeless households) which Global Green Certified LEED Platinum in 2015. Above, Blanca Mendez, a resident of Casa Yondé in Koreatown, emphasized the importance of safe, affordable housing for all. Casa Yondé required a general plan amendment, which Measure S would ban. Time and time again, our assessments and engagement bring up the need in communities in Los Angeles and throughout the U.S. for affordable housing. “Gentrification” is a concern in all of the mid-sized to large cities we’ve visited. Often, one of the only tools a neighborhood has to combat gentrification is to shore-up or lock-down its affordable housing supply. This is accomplished by keeping property affordable and in the neighborhood residents’ ownership (through a Land Trust such as Trust South LA) and by developing more affordable housing (creating more supply to assuage demand). Los Angeles’ need for affordable housing multi-faceted. The undeveloped and underdeveloped land is hard to come by. Land Trusts can only acquire and retain so much land to keep affordable. Many non-profit, as well as for-profit developers, have worked hard to increase the supply of affordable housing (see photo: Casa Yondé, by Little Tokyo Service Center CDC), but their work will hit a major wall if Measure S passes. As a LEED Green Rater at Global Green, I know that 100% of the LEED-Certified Affordable Housing we certify requires a general plan amendment. On average, we certify 650 units of Green Affordable housing in southern California per year. 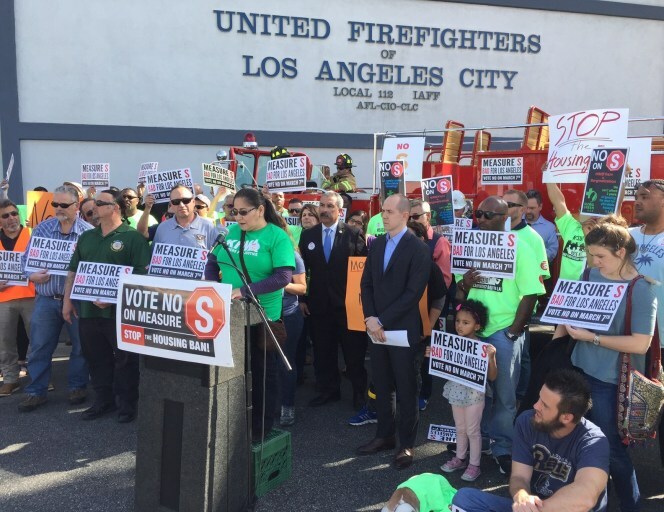 If Measure S passes, that’s 1,300 units that won’t be available for those who need housing the most- families making less than $63,000 per year. We urge LA voters, Vote NO on S March 7.